2 in 1 recycled fork pendant necklace. It is two pendants in one! 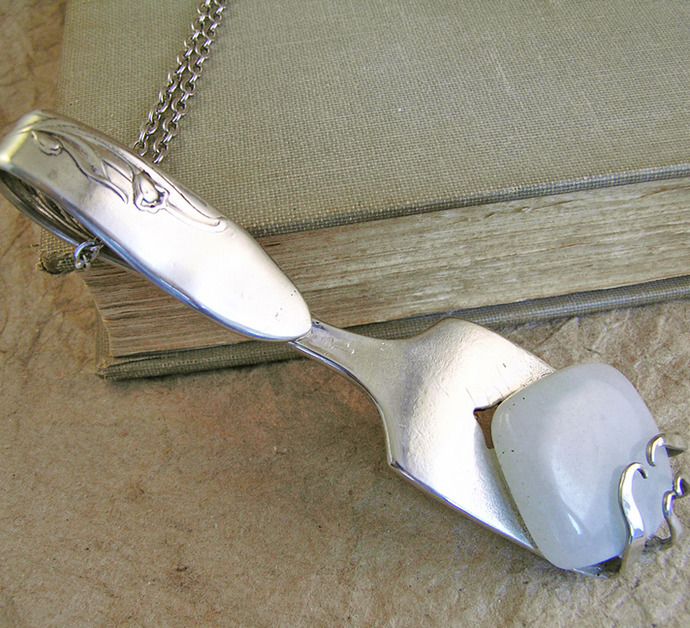 This lovely Vintage silver plated steel fork has been re-purposed as a beautiful two-sided white agate cabochon pendant. The tang of the fork has a beautiful lily flower detail that gives this piece a wonderful art nouveau feel. Wear in one direction and the white agate cabochon is surrounded by gentle curves and swirls. The other side has a more linear and geometric look accented by the shapes of the fork itself. This one of a kind pendant is perfect for any occasion! Nearly unbendable (I can assure you!) silver plated steel will keep its shape and luster with an occasional silver polish rub. This is an antique fork, so has nicks and scratches from use, but has been filed, polished and buffed so as to offer no rough edges or places that will catch on your shirt. The age and imperfections of the piece add to its character! Measures 3 3/4 inches long and 1 inch wide. On a 20" silvertone chain with lobster claw clasp. Chain can be lengthened or shortened upon request free of charge.